With 560 miles of coastline, 81 sandy beaches; quaint villages; exquisite landscapes; ponds; cranberry bogs and marsh vistas; quiet wooded trails; 106 miles of bike trails and brilliant sunsets over Nantucket Sound and Cape Cod Bay, it is no wonder people from all over the world call Cape Cod their home. They are not so small that you will feel limited; but not so large that you will feel lost. People come because they are attracted by the cool summers, lingering falls, mild winters, peace and quiet, slower pace, clean air, low taxes, proximity to Boston and a close-knit community spirit. Art galleries line our streets and byways, museums provide insights into the Cape’s - and America’s - historical, geographical and cultural roots. Our Cape light has drawn artists for nearly two centuries. Listen to symphonic or theatrical performances any of our dozens of venues or almost any summer night on a local village green. 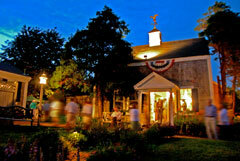 Celebrate Cape Cod’s four centuries of architecture and the enduring history of this amazing peninsula. We are proud to call this corner of Cape Cod our home - and we hope you will too. You can search through MLS listings by a specific community using the recommended search categories we've set up for you. You can also create an advanced search based on criteria of your choice. If you have questions about the Cape Cod area or would like some advice moving forward with your property search, don't hesitate to contact us today and we'd be glad to point you in the right direction!